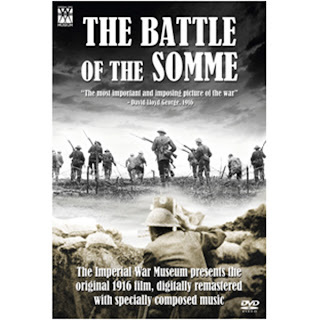 Home » Ireland » Uncategorized » Towards the Somme – a personal Journey. 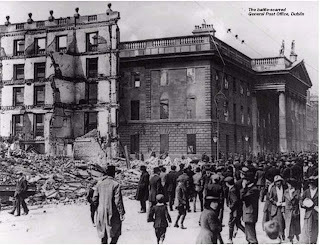 The Easter rising was not generally supported in Ireland which witnessed widespread destruction in Dublin as well as 132 dead among the British forces and the police and 318 Irish deaths, mostly civilians. Prisoners were jeered after the surrender, and executions were demanded in motions passed in some Irish local authorities and by many newspapers, including the Irish Independent and The Irish Times. This is not too surprising with thousands of Irish soldiers fighting as volunteers in the British Army and the general view that by striking in time of war the rebels had committed treason. However, the number and swiftness of the executions, combined with the arrests and deportations and the destruction of the centre of Dublin by artillery, led to a surge of support for the rebels. By 1918 with the end of the Great War and the General Election two Ireland’s had emerged. The general election of 1918 was the first (because of the war) since 1910 and the first (because of the Representation of the People Act) where non property owners and women (albeit, aged 30 or over) could vote and is seen as a key defining moment in modern Irish history. With the electorate increasing from 700,000 to two million in Ireland it saw the overwhelming defeat of the moderate nationalist Irish Parliamentary Party (IPP), which had dominated the Irish political landscape since the 1880’s, and a landslide victory for the radical Sinn Fein party, which had never previously enjoyed such significant electoral success but which now won a decisive majority of 73 out of 105 seats in Ireland. The aftermath of the elections saw the convention of an extra-legal parliament, now known as the First Dail, by the elected Sinn Fein candidates, and the outbreak of the Irish War of Independence. 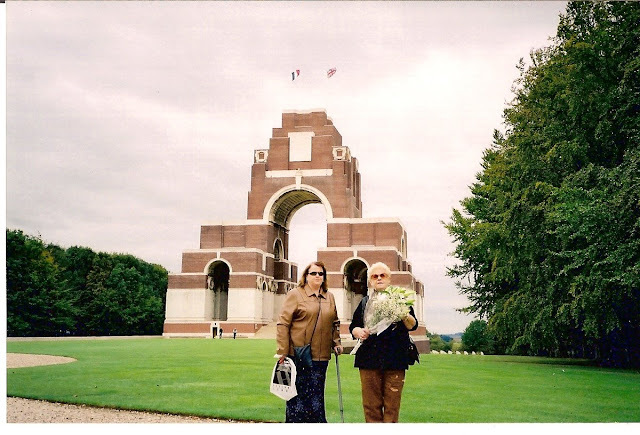 It is against this background that I found myself with my wife and her aunt travelling across Picardy towards the Somme and the Aisne for both our families had contributed to the fallen in the Great War. We had researched their lives and deaths, found where they were commemorated or buried and were now the first members of our families to visit where they died. The landscape of the Somme battlefields today is pleasant but unprepossessing; if the Somme wasn’t there nobody would need to invent it. My wife’s great uncle, Private Edward Kenny, originally from Edenderry, Co. Offaly had fallen with the 2nd. Bn. Argyll and Sutherland Highlanders, at the Somme on the 27th August 1916 and he’s commemorated alongside 72,088 others at the dramatic “Monument to the Fallen” memorial designed by Sir Edwin Lutyens at Thiepval on the D73 road between Baupaume and Albert. This monument is for soldiers who fell at the Somme who have no known grave or were not identified and his name is inscribed on panel 15C. 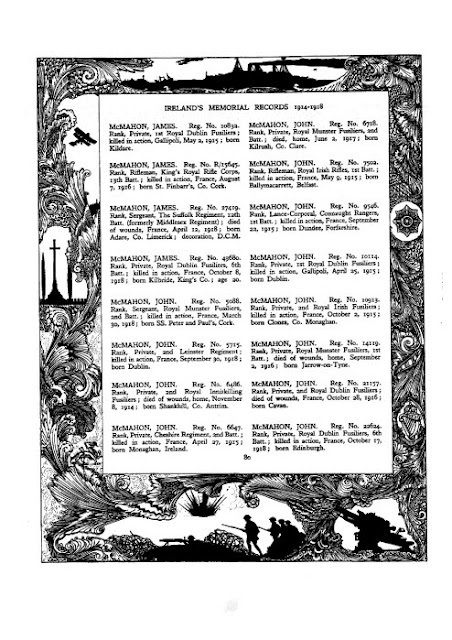 The entry in “Ireland’s Memorial Record” shows he was 24 when he died. To escape from poverty in Ireland they had moved to Bonnybridge near Glasgow and worked in the summer months as “tattie hoakers”, the term for agricultural labourer’s who worked on the back breaking potato (tatties in the Scots dialect) harvest for bed and board and low wages. He joined up with the venerable Argyll and Sutherland Highlanders who are based at Scotland’s historic Stirling Castle and is commemorated on the Roll of Honour there and at The Scottish War Memorial at Edinburgh Castle. Disgracefully, to visit the latter you now have to pay an expensive admission charge into the tourist theme park which is the modern Edinburgh Castle. We were able to trace his war record from a photo which showed the distinctive hat band of the Argyll and Sutherlands. His brother (my wife’s maternal grandfather) served in the Merchant Navy during the war and survived to live to a ripe old age. Today travelling along the unremarkable countryside of the Somme on the straight D7 road it takes barely 20 minutes to traverse the 12 miles from the front line on 1st July to where it had moved to by the 18th November when the 12 battles which constitute the Battle of the Somme ended. 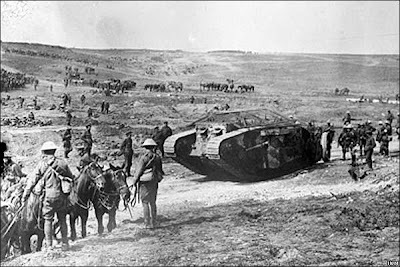 By that stage British and Commonwealth forces were calculated to have lost 419,654 (dead, wounded and missing); French losses amounted to 204,253. 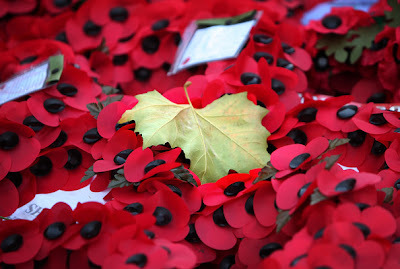 German casualties were estimated to have between 437,000 to 680,000. Edward Kenny died towards the end of August, a month which was characterised by a campaign of attrition of pointless attacks and counter attacks which achieved no strategic or territorial advantage for either side but left thousand of irrecoverable bodies to be churned into the muddy morass of no man’s land. At Thiepval there is a fine and moving visitor centre set trench-like into the ground and not far away there is the Ulster Memorial. This is a replica of “Helen’s Tower” on the Marquis of Clandeboye’s Estate near Bangor in Co. Down where the Ulster regiments did their training. 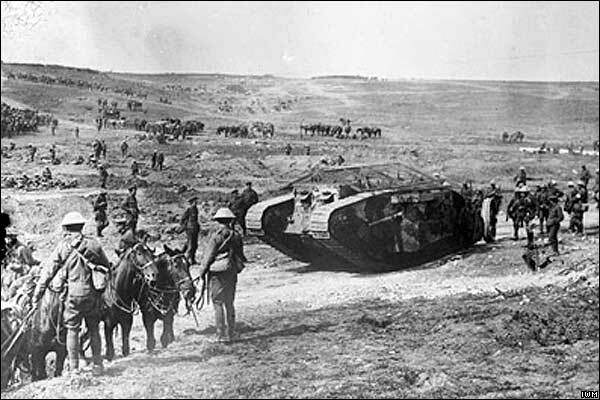 They took particularly brutal casualties in the first week of the Battle of the Somme but were the only forces to actually take their designated objective under General Rawlison’s battle plan. 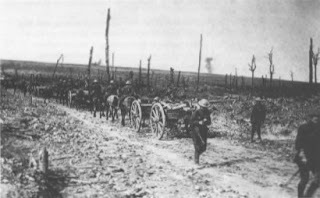 In a bitter blow, because the rest of the army had not advanced, they were forced to retreat from the salient they had created at such cost. 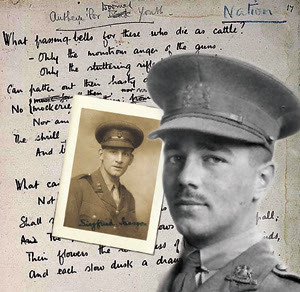 Wifred Owen. He died in 1918 in the same week that WW I ended. The war was botched on the German side as well. They were pulled into the war unwillingly, because of a defense treaty with Austria. Then they hoped to overrun France quickly, as they’d done in the 1869 in the Franco-Prussian war, and in August 1914, Germany planned a quick, total victory over France, requiring only six weeks — too quick for the British troops to be deployed to stop the advance into France. 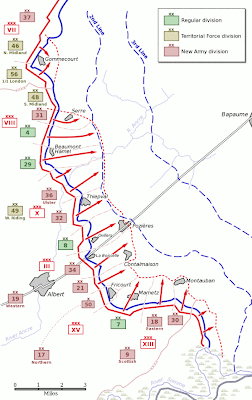 The plan went fantastically well for about two weeks — but then the Germans sent two corps of soldiers to the eastern front to fight the Russians. 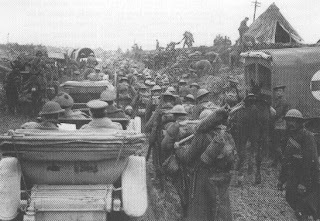 Without those soldiers, Germany’s rapid sweep was halted by the French long enough to give the British troops time to reinforce the French. 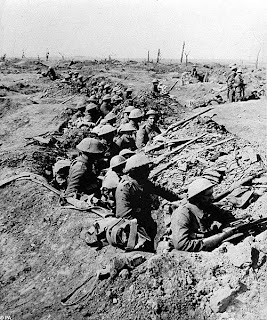 Both the German and French sides dug themselves into static trenches. 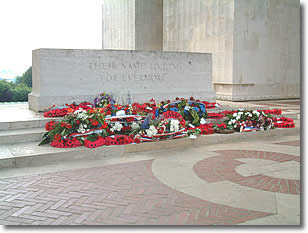 For many years all that greeted visitors to Thiepval was the 150-foot marble and brick memorial with the names of 72,000 British, Irish and South African soldiers. 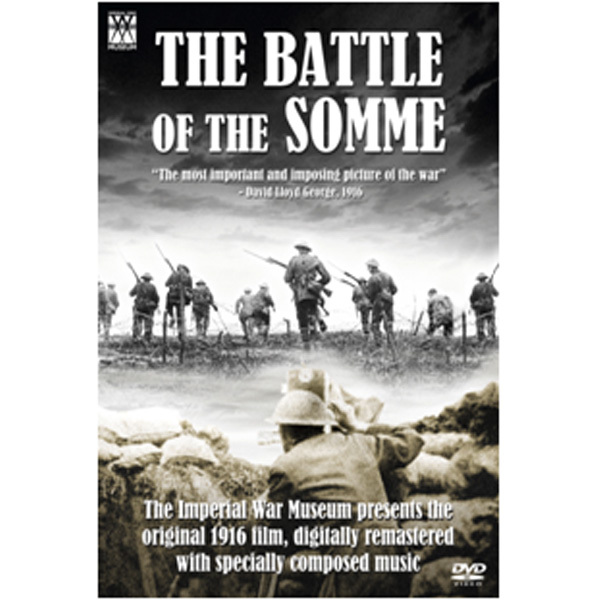 Now an educational centre has been built with the support of British charities and the Conseil Général of the Département of the Somme. 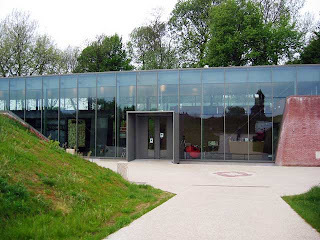 Over 160,000 people visit the site and the centre has a permanent exhibition explaining the history of the battle, a gift shop and improved parking and restrooms. 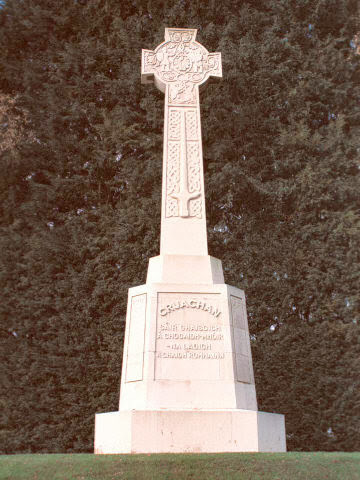 Almost 90% of those commemorated on the memorial died between July and November 1916. They include the composer George Butterworth whose music is played as a background in the Visitor Centre. 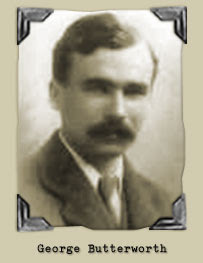 George Butterworth was born in London in 1885 to a privileged family. He went to Eton, then to university at Oxford. Already a talented composer, music became more and more important to him. Like his friend Vaughan-Williams, he loved to collect English folk songs. At the outbreak of the First World War, he joined the Durham Light Infantry as a lieutenant in the 13th Battalion. 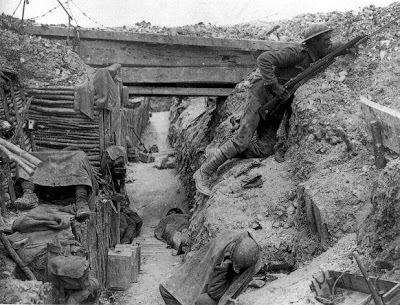 During his year in the trenches, he was mentioned in despatches for outstanding courage, won the Military Cross for his defence of a trench that was later named after him, and led a raid during the Battle of the Somme. The raid was successful but Butterworth was killed by a sniper’s bullet on August 5th 1916. His body was never recovered. His music captured the spirit of the English countryside that he fought for, and died to preserve. 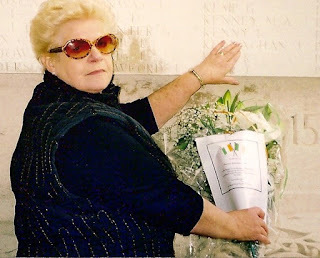 When I mentioned our forthcoming trip to the battlefield’s to my mother, much to my surprise, she told me she too had an uncle who perished in the war. 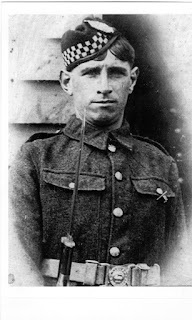 He was Private James Mc Mahon of the 6th. Bn. 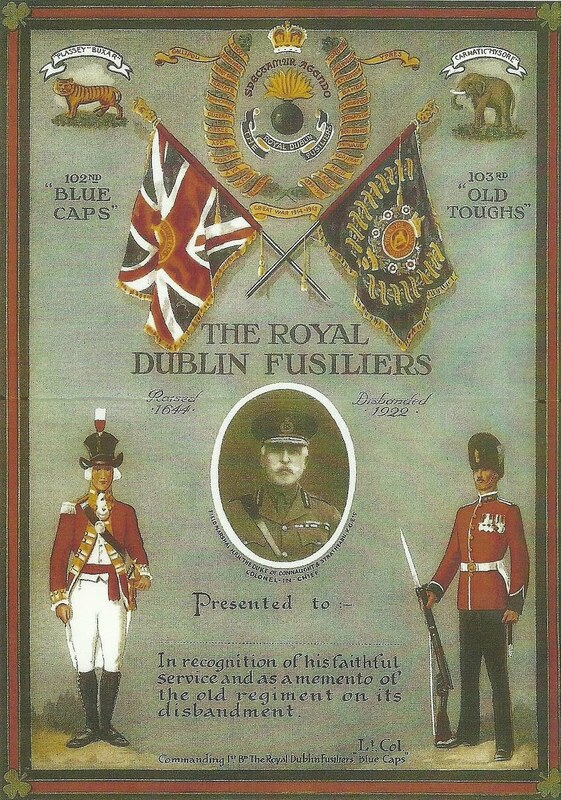 Royal Dublin Fusiliers and by coincidence my great uncle hailed from Clara, Co. Offaly, the same county as my wife’s great uncle. 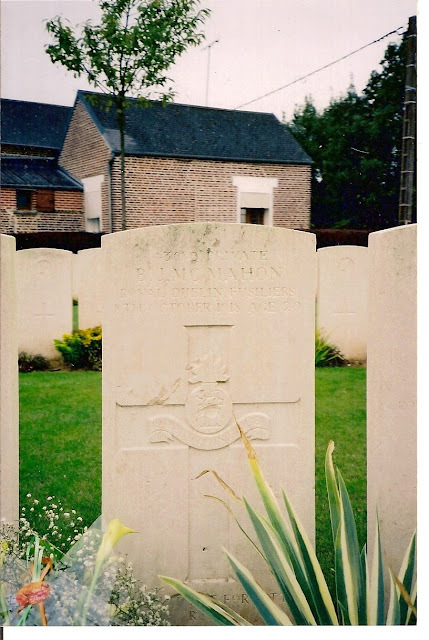 Unlike my wife’s relative James McMahon had a grave in the Aisne, the Department beyond the Somme whose capital is Cambrai and where the front line had stopped when the hostilities ended with the Armistice at 11 in the morning on the 11th November 1918. 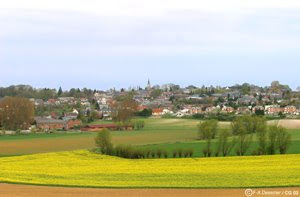 Like much of the battlefields Beaurevoir is an unprepossessing and sleepy French “village” which actually straggles over two kilometres and has a population of 3,500 well dispersed inhabitants. In this area it contains 4 military cemeteries, Prospect Hill, Beaurevoir Communal Cemetery, Beaurevoir Extension Cemetery, and Beaurevoir British Cemetery where James McMahon is buried. 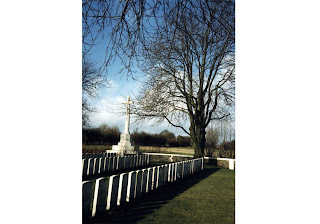 Like all the Commonwealth cemeteries it is beautifully maintained and lies on the edge of the village with the standard layout of the Cross of Remembrance and a shelter for visitors which also holds the Book of Remembrance. James lies in a row of other Dublin Fusiliers aged from 18 to 21 with his name on the headstone given as “B. J. McMahon”. I wasn’t expecting to feel a great deal of connection with somebody who died so many years before I was born but being there amongst the graves of so many young Irish soldiers who all died on the 8th October 1918 was surprisingly moving. 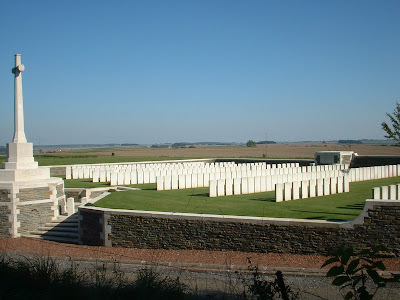 There is great respect shown to these cemeteries by the way they are maintained by the War Graves Commission and by the local French communities. 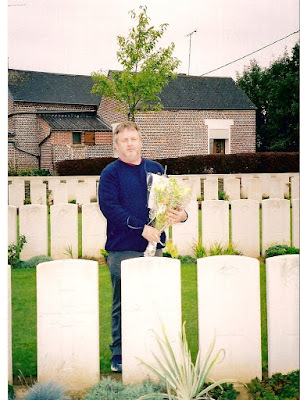 I wrote in the book in French “Thank you for looking after him so well” and we all laid a wreath entwined with a ribbon in the colours of the Irish tricolour and a Poppy Cross on the grave with the inscription “Remembered with respect by his family in Ireland”. 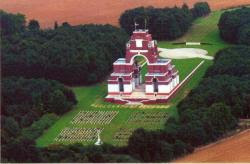 We had laid one the previous day at the Thiepval memorial with the same inscription in memory of Edward Kenny. Surprisingly, given the history and the pathos of the battlefields and cemeteries this is a fine part of France with great interest in the history and the towns. 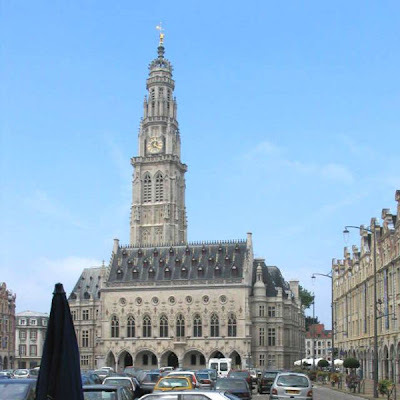 Arras, where we stayed, is a wonderfully atmospheric Flemish town with two superb squares which have been preserved from the 13th Century. 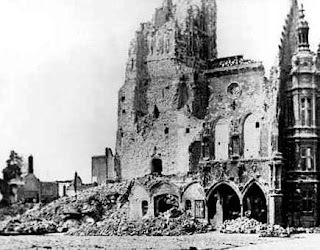 It was on the front line for most of the 1st World War with no less than 3 Battles of Arras and is overlooked by Vimy Ridge where the Canadians took terrible casualties. Underneath the town are impressive Roman catacombs much enlarged over the centuries and which served as a huge underground field hospital during the war. It was also occupied by the Germans in 1870 and 1940. 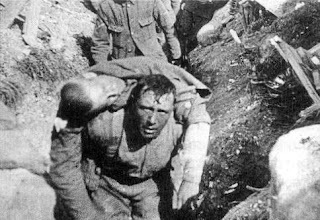 Francis Ledwidge, as one of the “War Poets” could have been writing about any of the fallen of the Great War. However, in an illustration of the difficult loyalties of Ireland he was writing in memory of his fellow poet and great friend, Thomas McDonagh. He was one of the leaders of the 1916 rising and a signatory of the Proclamation of Independence of the Irish Republic who was executed by a firing squad of soldiers drawn from the same British Army in which Francis Ledwidge was serving. 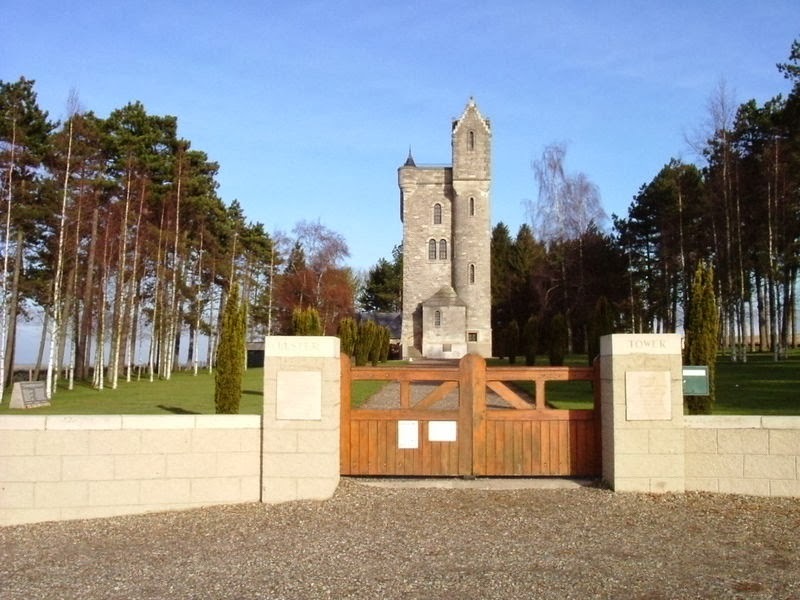 In our fallen relatives home towns of Edenderry and Clara there are still “British Legion” houses provided for ex-soldiers and their families and in the decades of poverty and economic stagnation many Irish families were quietly grateful for the “War Pensions” they received. 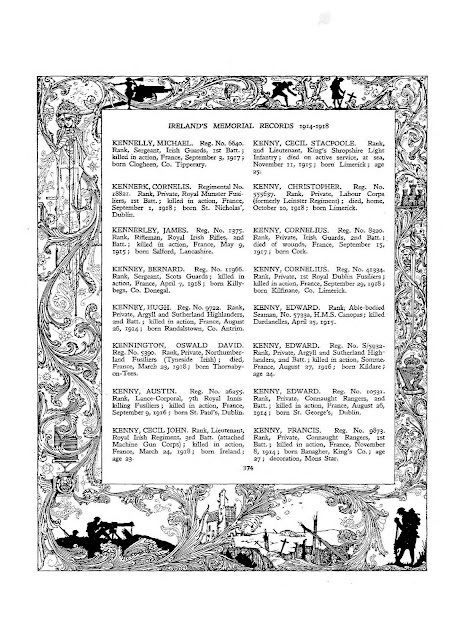 Ireland was neutral during the Second World War but many served in the British forces and many also worked in England both to survive and help the war effort including my Grandfather and two uncles who travelled on British Legion travel warrants and worked for the electronics firm Lucas in Birmingham during the war whilst living in a company dormitory. My father at the age of ten and his family on the other hand came in the other direction as refugees from the devastating blitz in Coventry.